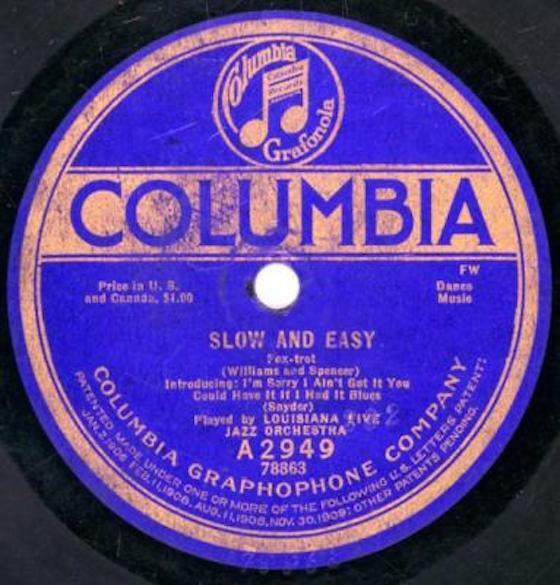 Change the meter of a 1918 jazz recording by the Louisiana Five. This project was published in the evening, California time, on Thursday, May 29, with 11:59pm on the following Monday, June 2, 2014, as the deadline. Step 3: The new meter of your project is the first die over the second. Thus, the result from step 2 would mean your new meter is 5/7. Step 4: Rework a segment of the source track and in the process change the meter from the original to the meter that was determined in step 3. You may add additional audio, but some prominent aspect of the original source track should be evident in your final work. Deadline: Monday, June 2, 2014, at 11:59pm wherever you are. Length: Your finished work should likely be between a two minutes and four minutes, but there’s no formal length requirement. Title/Tag: When adding your track to the Disquiet Junto group on Soundcloud.com, please include the term “disquiet0126-nolaremetered” in the title of your track, and as a tag for your track. I don’t understand, unless I’m understanding what’s meant by meter. I thought the lower bit on time signatures had to be a binary number – 1, 2, 4, 8, 16 etc (breve, semi breve, minim, crotchet, quaver etc). With the 5/7 example, I wouldn’t know where to start – you could argue the 7 equates to three 32s/semi quavers, so a bar would be fifteen of them (five times the three 32s) so more traditionally notated as 15/32. Would that work, or am I missing something?
? And maybe multiply the faces of the two dice to get the top number? That’d give (4×6=)24/32 in the example, which is weird, but playable (and easy to setup in most sequencers). Only problem with that is you won’t get any odd numbers (no 5, 7, 9, 13, all of which are fun) so maybe roll three dice and add them for your top number – that way we can have anything between 3 and 18 over anything from 1 to 32. What do people think? Stick to 5/7=15/32, adapt to two multiplied dice and have 24/32, or throw a third and get (eg I roll a 3, to go with the 4 and 6 in the original example) 13/32? Hi, Mr. Bish. Thanks for unpacking it all. I think one could go either way with this, either to come up with an approximation like you did with 5/7 or to just roll again as the rules suggest. Were you to go the third route, of an alternate outcome of the dice, you would be in a healthy lineage of Junto activity, though I’d argue for one of the above two options first. Thanks so much for the thought you put into this. Perhaps another way to look at this would be to use both numbers as numerators over the unit of beat, so 5/8 and 7/8, either alternating every bar, or as sections of each, maybe one for the verse and the other for the chorus. As I remarked on our very new forum, having the seven on the bottom is theoretically possible, most sequencers could be set up for a ‘seventh’ note as a unit of beat, but just thinking outside of the 4/4 box for some folks is hard enough. I am definitely looking forward to hear what the geniuses here do with this one!